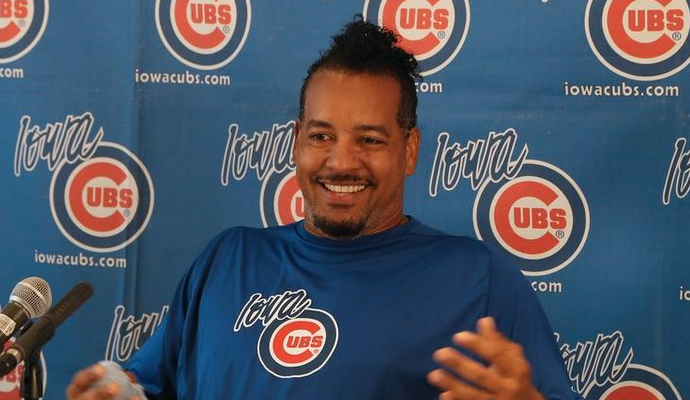 Manny Ramirez doesn’t jump out as coaching material because, you know, he’s Manny Rameriz.. But the dude could flat out hit. So the idea of the Ramirez being the Cubs new hitting — a rumor that has been floating about the web today — is a lot less ridiculous than the best of his Manny being Manny antics. The former Red Sox and Indian actually coached top prospects at the Cubs’ Triple-A Iowa club this year, including Javier Baez and Jorge Soler and received rave reviews as both an instructor and a mentor. Cubs GM Theo Epstein didn’t rule out the idea of calling Ramirez up to fill the hitters coach role on the big club when asked by the Chicago Sun Times yesterday. “I want to see whether he wants to continue playing or not before I answer that question,” Epstein told the daily. Ramirez had 77 plate appearance in Iowa, only OPSing .648. That plus him being 42 should probably convince Manny, who hit 555 home runs and had a .312 batting average over his 19-year big league career, to hang it up for good. However he is Manny, so you never know. In addition to Beaz and Soler, Ramirez would be teaching hitting to Cubs squad which features Anthony Rizzo, one of the top young sluggers in the game, and 22-year old speedster Arismendy Alcantara. Uber prospects Kris Bryant, who spent 2014 in Double-A, is also likely to get a call up in 2015. So there is going to be a lot of impressionable talent for Ramirez or whomever the Cubs’ hitting coach is to work with. Do you think Manny is a bold pick for the job, or a disaster waiting to happen?